Every year, the Perennial Plant Association sends each member a ballet to select a Perennial Plant of The Year. These plants tend not to be new introductions to the garden world, but have been tried and thus proven worthy for nomination. They need to be suitable for a wide range of climatic zones. The plant chosen must be low maintenance, relatively pest free and disease resistant. It must have multiple seasons of ornamental interest and be readily available for the year of promotion. 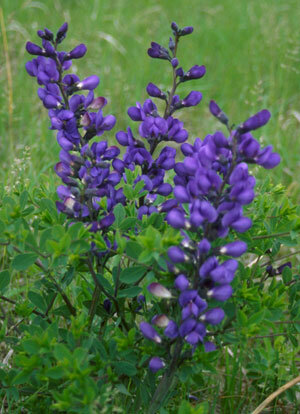 After the selection, the plant is promoted all across Canada and the Continental U.S.A. Baptisia australis Purple Smoke was chosen for the 2010 season. Baptisia australis Purple Smoke is a native plant throughout much of the central and eastern United States and is most common in the Midwest. North American Indian tribes discovered the uses of this plant long before settlers arrived; the flowers provided a source of blue dye and the roots were ground into a tea which was drunk to treat toothaches and nausea, a practice later copied by Europeans. This plant is now well known to gardeners for its attractive pea-like, deep blue flowers that emerge on spikes in the early summer. The oblong seedpods are popular in flower arrangements and may have caused the name “Rattle Bush” to become another popular name. Being extremely hardy in Zone 2, Baptisia requires little maintenance. It has been introduced well beyond its natural range, which means it is now found in gardens around the world. Attractive light green compounded leaves form a 3-ft. tall, bushy clump of grey-green foliage, with long flower spikes in shades of violet-blue. This plant belongs to the pea or legume family and is known to be a nitrogen fixer (taking nitrogen from the air and putting it down into the ground for the roots to use). Baptisia is easily grown in average, dry to medium, well-drained soil in full sun. Plants develop slowly into expanding clumps with deep and extensive root systems, and should not be disturbed once established. Whether grown from seed or transplanted into the garden, it will take several years to establish, eventually becoming a lush, full and stunning plant. And who is the Perennial Plant Association? The Association is a large group of greenhouse growers, retailers, landscapers, horticultural teachers and “plant geeks” that work in the industry. Members join from all around the world and meet once a year at the yearly convention. They listen to speakers, tour greenhouses and nurseries, participate in a trade show and share information with other industry members. The selection of a Perennial Plant of the Year began in 1990, when Phlox stolonifera was awarded as the first plant of the year. Next was Heuchera micrantha Palace Purple and from that time on each year another perennial was picked and promoted. For more information on the Perennial Plant Association and past Selections for the Perennial Plant of the Year, check their web site at www.perennialplant.org.